Ok, friends. Last post / project before I completely pack up my entire craft room and transport lots and lots of boxes and start all over again in a new room, in a new house. I can’t WAIT to show you the transformation from start to finish. Tomorrow, I’ll post my inspiration for my new craft room with some things I’ve already purchased. Friday is the big move! BUT – tonight – a card I made with Unity Stamp Company Stamp of the Week. I *really* need to work on following this quote better. For realsies. I LOVE this stamp. In fact, I’ve been completely head over heels about this Stamp of the Week action. I have loved each and every one I’ve received so far. No surprise, as I am clearly a Unity FREAK. haha. Anyway, I also got to play with a few of the new colors from The Twinery. LOVE. The colors are beautiful in real life and really round out my collection. 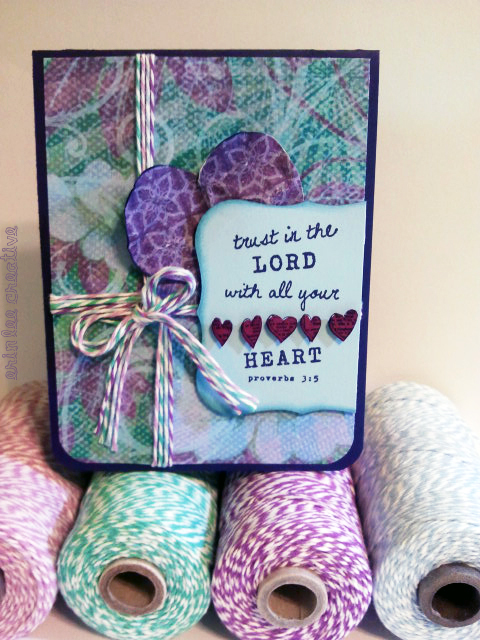 The purple hues are from Stampin Up – a few of my faves – Concord Crush and Rich Razzleberry. I cut out the hearts in Rich Razzleberry and popped the hearts from the stamp base as well. Until next time….I’m about to go tape up a box! I really hope everything gets across town unharmed. Have a great week peeps!